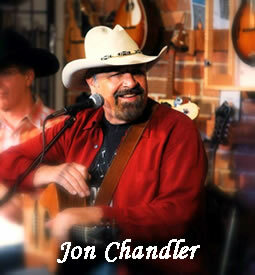 The Los Angeles Daily News dubbed Denver native Jon Chandler the “best western songsmith since Ian Tyson,” while Texas’s Country Line Magazine exclaimed, “Thank God for Chandler and his gang of musicians.” He hosts America’s Soul Live, a monthly Arvada, CO-based acous-tic concert series. Jon was chosen Best Living Western Musician by True West Magazine, which also named his Westerns “best Western CD”. He was awarded the Western Writers of America’s prestigious Spur Award for Best Song two times, the first in 2009 for Linwood, a fictional examination of the last hours of the notorious gunman Doc Holliday’s life, and the second in 2012 for Morning Star Moon, his observation of Wyoming’s iconic Hole in the Wall country. He is the recipient of the Western Folk-life Center’s Yellowstone-Teton Songwriting Contest Audience Award for his song, The Road That Leads to Yellowstone. A prominent western writer, he won the WWA Spur Award for his novel, The Spanish Peaks, and his novel Wyoming Wind was a Colorado Book Award finalist. His newly released seventh CD is entitled The Gang.